Kendra Perry: Hello, hello there, welcome to High On Energy TV. I am a super, super excited to be here and bring to you some more amazing content on today's episode. So I am your host Kendra Perry. You can find out more about me at kendraperry.net and as always, let's talk about some stuff to help you boost your energy. And so today's episode is going to be just slightly different than what we normally cover on the episode. And the reason for that is because we're going to be talking about something that's maybe a little bit more relevant for practitioners, but I know I have practitioners in my audience. So I just want to talk a little bit about a tool, my favorite tool to use when it comes to improving people's energy. Okay. And I mean, there's a lot of theories out there about testing and what is the best test to send out to your clients if you have people who are struggling with energy. But my very, very favorite tool in the whole world to use to help not only with energy but pretty much with any symptom that a person might be dealing with is actually a hair mineral analysis kit. Okay. So what a lot of people don't know is this is a very effective and also very affordable way to assess a person's unique biochemistry and physiology. Functional testing is expensive, right? Like if you are going to run like a GI-MAP, if you're going to get into the gut testing, into hormone testing, run something like a DUTCH, I mean, you're going to be spending several hundred dollars and especially with the GI-MAP, that's definitely a pretty high price point. You can literally spend thousands of dollars on testing, but one of the most amazing things ever is that hair mineral analysis is pretty affordable. It is probably the lowest price point for any tasks that I've ever really seen out there. Obviously depending on where you're getting it from and who you're ordering it from. But I think that's pretty cool because my biggest complaint with functional medicine is that it's not really available to everyone. Right. When something costs thousands of dollars that's kind of a big deal. Sorry, I think my microphone is a little bit further away from me than it should be, I'm a little excited today because I love talking about hair mineral analysis, but yeah, functional medicine is amazing. I think we all need it. I think we need ... We all need to be doing testing just because if you're not testing then you are guessing, right? Everyone's different, I don't know what the heck's going on in your body. Like your the most intelligent, experienced, educated practitioner in the world doesn't know what's going on in your body unless they test. Otherwise they're making maybe educated guesses or there may be going with their intuition. But honestly, we really do need testing in order to get that legitimate scientific information to give us a course of action and to give us a path to follow because even if you have a really well educated practitioner who maybe has some really good intuition and has an idea of what might be going on in your body, it can be really hard to commit to all the things that they're asking you to commit with if you are not 100% sold on that, that's actually what's going on with you. And especially if you don't also have a way to track that, right? Like we want to be able to follow up and know, okay, what we're doing is actually working. This is the right thing. We're seeing progress in the results or we're not seeing progress. So what we're doing isn't working and it's not actually what we should be doing and we need to totally change course. So I can sit here on my high horse or on my soap box or whatever for the next while and talk about the importance of testing. But if you guys have been listening to the podcast or tuning in for High On Energy TV, then you know that I'm really into testing. So I really think hair mineral analysis is amazing because it is really cheap, but it gives you an insane amount of information about the body and it correlates more than any test I've ever come across. Okay. And so what I mean by that is I can look at a panel and be like, okay, this is probably what they're experiencing symptom wise and this is probably how their personality is. So there's a lot of mood connections and personality connections based on the various mineral patterns that we see. So I can look at that and get an idea like, oh, this person is a type A personality. They probably push, push, push. They probably really busy. They probably take on a lot of tasks or I could look at that and be like, wow, this person probably feels pretty depressed. They might even feel a bit apathetic, like a bit disconnected from their emotions or kind of like they're not really feeling much in terms of ... They're kind of like that stone cold statue. Right. And so that's what's really cool about that. You can also get insight into thyroid, into adrenal health into digestion, into blood sugar regulation into hormones, into the nervous system, heavy metal, toxicity, detoxification, chemical sensitivity. These are just amongst some of the things that we can see. I can see what if you are in the alarm stage of stress or the exhaustion stage of stress. It's crazy, it's a really cool test and I've come to love it. And I also think it is a really good standalone test. Yes, sometimes we do need to test the gut, we want to see if there's infections. We want to balance hormones totally. But if you're like, I don't have a lot of money, what is my best use of my dollars? I will tell you to do a hair mineral analysis every time, regardless of whether you have hormonal issues, gut issues, brain issues, whatever issues you could be having because the mineral system is very important. Minerals are the co-factors in every single enzyme reaction in the body. And a lot of times they're actually the enzymes themselves. So if your minerals are out of whack or they're out of balance with each other, I mean you're going to end up with all kinds of different symptoms, right? It just kind of depends on you and what your genetic weaknesses are. So like I said this episode today is going to be a little bit more focused on practitioners and health professionals out there who are interested in learning the basics of HMA or hair mineral analysis. Hair mineral analysis is HMA. But if you are kind of a nerdy maybe you're not going to be a health professional and you don't aspire to be one. You can use the information from this episode to get an idea if the person who is reading your hair mineral analysis should be the one reading your hair mineral analysis. Because unfortunately this test is very misunderstood and very misread and I've literally had hundreds of people contact me. I have people contacting me every week, who are like, "yeah, this is what my practitioner told me to do based on these results." And I'm literally getting goose bumps and I'm cringing because it's not right. And what they are telling that person to implement or to bring in isn't actually going to help fix the issue. And that's really unfortunate because I think it gives this test a bad name, right? Because I think a lot of people don't have a great experience with it because as practitioners it's hard to interpret and as clients we often have it misinterpreted for us. So that leads us to believe it's not accurate or it's not as powerful tool as it really is. And your practitioner who might be misreading your hair mineral analysis, it's not their fault, don't get mad at them. There is a very massive lack of training out there on hair mineral analysis. It's actually really hard to learn about. When I started to realize its power and I realized that I wanted to bring it into my life and into the lives of my clients. I took every single training out there that existed that I could find. And every single one of those courses was very interesting. It gave some good information. It helped me maybe understand the panel a little better, but every single one of them lacked practical and clinical application. So sure, I understood what I was looking at sort of, but I didn't actually know what to do with the results or how to actually develop protocols that would help fix the situation that we were looking at. And I was really frustrated by that. And I spent years figuring it out on my own by following various experts and listening to podcasts and going on PubMed and Google Scholar and diving into the research. And I had to hire a certain HMA practitioners that costs me thousands and thousands of dollars. One woman I was working with who is a true expert, she's one of the biggest experts in the field, but I was paying her $600 an hour to get this information from her. So it was really hard and I had to really want it. Okay. And so that's why I'm saying don't blame your practitioner who maybe doesn't know how to read your hair test, because honestly it's not readily available information. And actually that's one of my big missions is to change that. And so I'm actually going to be running a six week live practitioner training on hair mineral analysis this February. We'll be starting February 21st and this course is going to dive deep into the primary mineral patterns that you see on hair mineral analysis, but it is going to focus heavily on the clinical application and how to actually develop the hair mineral protocols to actually help people get well. So pretty excited to teach this course. I have about 10 or 12 people signed up. It's going to be awesome. I'm going to give you everything I've got and I'm going to make you feel like an expert in HMA. And so if you are a health professional or you're just a pretty nerdy person in general and you think that you can keep up and understand this information I would love if you would join me, just send my business page a message, I'll send you the details. Yeah, I'm going to be getting the info page up shortly. And so once that info pages up, it will be go.Kendraperry.net/HMA. If you go to it and you get an error message, it's just because I haven't quite finished it yet. I'm jumping on this really quickly. I literally decided to create this course last week when I had a whole handful of practitioners being like, I want to learn this. Will you teach it? Please teach it, create this course. So I was like, okay, I'm going to do it. So yeah, I'm kind of scrambling to get everything together, but that will be happening for anyone who's interested. And guys, if you're on with me live right now say hey, because really all I see is a little eyeball with the number five and I have no idea who you are. So give me, hey, give me a heart, give me a like. Let me know that you're here so I can say hi to you personally. Okay, so let's jump into it guys. 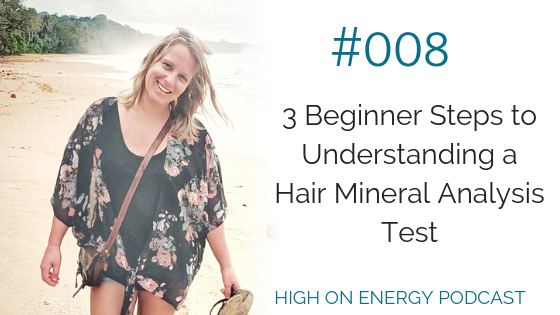 We're going to talk about three simple or sort of like beginner steps to understanding a hair mineral analysis task. So this is very beginner, but you need to know these first before going deeper into this test. Okay? So number one, this is really, really important and this is actually the primary way that practitioners actually misinterpret this test. And that is they read it as it is. And what do I mean by that? Well, they just look at it exactly how it is. So they're like, okay, you're high on this, so you're eating too much of this. Stop eating foods with that in it. Okay, you're low in this. Okay, you need to eat more of this. That's actually a huge mistake because the hair is an excretion, right? So this is minerals that are being pushed out of the body and we need to interpret, this is where all the big interpretation comes in. Why is it being lost? Is it being lost because your body has too much of it. You're over consuming it. You have too much of it in your life or because your body can't hold onto it because there's something else going on with some other mineral or vitamin that is causing it to be lost and pushed out of the body. Okay. And so listen carefully when I say this, okay. The mineral system is dynamic. Every mineral has an effect on every single other mineral in the body, either directly or indirectly. Okay? So you can't look at one mineral in isolation and just be like, oh, calcium is high. Stop eating calcium and that'll make your calcium go down. That is the biggest mistake with hair mineral analysis. And that's a big reason why it's misinterpreted, especially when it comes to magnesium. Because high magnesium typically indicates actually a loss of magnesium. And isn't actually high magnesium in the body. So that person more than anything actually desperately needs magnesium like needs magnesium or they need something to make it more bioavailable. But that practitioner might be telling them, oh your magnesium levels are good, so let's start pulling magnesium out of diet because it's actually too high. Okay. So this is what I mean. So you really ... So if you want to get educated on hair mineral analysis, where you should start is actually learning about the various mineral relationships and which minerals are antagonists. So they decrease the absorption of the other and which are synergists so they enhance the absorption of the other. And you might be wondering, well this sounds like a lot of information Kendra. Like where should I actually got this from? Okay. So want you to Google when you get off the podcast or the episode with me, Google mineral wheel, I'm pretty sure that we'll bring it up, but it's very cool. And let me actually see if I can bring it up right now because it would actually be really cool for me to show this to you. And maybe you would understand a little bit better. okay, that's awesome. Let's pull it up and now let's see here. Okay, I'm actually gonna share my screen guys, just gimme a second. Okay. Can you see what I'm looking at? Let's see here, primary display, that's not it, that is something totally different. Okay. It's weird though because when I look at it, I just see an empty screen. I don't actually see the window that I have up. So maybe what I'm going to do quickly guys is I'm just going to look in, I'm going to go to my Facebook page and I'm going to see if I can actually do this populating and let me know you should actually see a mineral wheel. So if you're in the audience right now, just let me know. Can you see the mineral wheel that I am looking at because I would love to know. Okay. And so in my Facebook page is actually kind of delayed. let me know you should actually see a mineral wheel. So if you're in the audience right now, just let me know. Can you see ... Yeah. I don't think you can see it, I don't know why that is like so confusing to me. So maybe what I'll do is I'll bring this down to my lower screen. Jenny's here. Hey Jenny. And I'll actually switch primary display. Yeah. So I don't think you can see it. I don't know why that is like so ... That's so weird. I've actually never had this, it's like why can't you see my, that's my slack. You can see everything, but what ... Okay, so that's not actually working. Just mountains. That's so weird. So you're actually not seeing what I'm looking at. I've actually never had that problem before, so I'm going to try to explain this and the best way that I can. Okay, so Google mineral wheel and pull up the images of what you'll see is that you'll see a big wheel, let's see here. I should also turn down myself talking on my phone. And so what you'll actually see is you'll see this big wheel and you'll see all these lines going through the middle. It kind of looks like ... I don't know how to describe it, but anyways, so what you're gonna see is you're going to see a wheel with all the various elements and metals that all surround the mineral wheel. And you're going to see arrows on the line in between. And the arrows that push towards each other mean that those are, they're synergist and they're antagonists when the arrow just points in one way and not just towards each other, it means that that mineral enhances the mineral. So I don't think I'm explaining this very well. So let's, okay, let me try again. So you'd have this big mineral wheel and there's all the elements around it. And so let's say that you start ... You go to the very bottom, the very bottom you actually see mg, which is magnesium. And if you follow that arrow up, you'll get to calcium. And what you'll notice in the middle of the line that connects magnesium to calcium are arrows that point towards each other. So what that means is that these minerals, calcium magnesium are synergists. So they enhance the absorption of the other, but they are also antagonists. So they also decrease the absorption of the other. So that means that in a proper levels they are synergists and they enhance each other, but if they get too far apart, they actually push quite strongly against each other. Okay. So hopefully that makes sense. Okay, so I'm going to try to find another example here. So if you go to the left, you'll see Pb. Okay. And then Pb connects to, let's see here. So Pb connects to chromium. Okay. And so PB is lead. Okay. So lead, you'll see the PB, and you'll see the line that goes to chromium and you'll just see one arrow pointing from lead to chromium. So that means that lead is antagonist to chromium which means that lead can push chromium out of the body and reduce its absorption. So I hope that makes sense. I might be kind of butchering it. I really hope I could have showed this on my screen. It's so weird that I couldn't show that to you, but check out that mineral maybe. And you could probably get an online description of that, maybe a little better than what I can give you when we're not actually looking at it. But what I want you to ... The reason I'm bringing this up is because you need to understand the entire dynamicness. I don't think that's a word, but let's pretend it is of the mineral system. So when you're looking at magnesium and it's high, you can be like, okay, the first thing you want to think, well, is that high because it's high in the body or is it a loss? And you want to look at the other minerals, consider those relationships and make interpretation based on this. So if you just read it as it is then that's how you're going to misinterpret it. So that's number one. Don't read it as it is when you're looking at each mineral. Consider all the other minerals. And obviously that's very complex way easier said than done. I mean this took me years to learn, but that's okay. And so number two is to focus on the macro minerals. So when you look at a hair mineral analysis, there's a lot of minerals going on. It's really overwhelming. It's really confusing. But what matters are actually the first four minerals, calcium, magnesium, sodium, potassium. These are the body's primary electrolytes. They are responsible for running pretty much everything in the body. So when you are thinking about balancing minerals and what you should actually do to help this person or help yourself with those first four minerals, you should be only the implementing things as a new practitioner on those first four. Because if you can bring those four back in the balance, a lot of the other ones will actually follow. Okay. So focus on the first four or the macro minerals. Don't get stuck down all the other rabbit holes that you can go on with all the like 30 other elements and metals that are on the test. Focus on the first four. That's gonna help bring the body back into balance. And it's going to help with detox of metals as well. Okay. Yeah, so I think Brittany just posted a link. I actually can't see what that link is. I just see it's a gift link, but maybe it's a mineral wheel, I don't know. Okay. So number three, okay is focused on the significant ratios. So sure, we want to look at each of the minerals on their own, get an idea of maybe what's going on. But really what matters is the balance between minerals. Because if you can remember what I said initially, some minerals are antagonists and some are synergist. So we care about the balance between the minerals. So if the calcium magnesium ratio is really high, that means you have way too much calcium compared to magnesium. So you probably actually need magnesium. Even if magnesium looks normal on its own, you want to actually support that magnesium. The other thing, so there are a bunch of different significant ratios if you're looking, and the only two labs that I recommend guys are ARL and TEI. I don't recommend any other labs out there because they wash their hair samples and that will actually create great variability in the results. So stick to Analytical Research Lab ARL and stick to Trace Elements Incorporated or TEI. And they will actually give, there's a little section that says significant ratio. So always look at the ratios. Like I said, if calcium is really high above magnesium you probably need magnesium. If sodium is really high above potassium you probably need to potassium. If calcium is really high above phosphorus, you probably need phosphorous. Of course, this is pretty basic. Obviously I don't recommend that you go out and try to interpret your own hair mineral analysis because this is something that took me years and hundreds and hundreds of hours to learn. But this will maybe help you if you are a client working with a practitioner to get an idea if what the protocol that practitioner is giving you is actually a good protocol. because if they're not focusing on the macro minerals, if they're reading it just as they see it, if they're not looking at the significant ratios and trying to balance those out, then that's a red flag. Okay. So they probably need more training and you probably need to find a different practitioner. Okay. So I'm just going to do a quick summary of what we talked about and then I'm going to go to questions. Okay. So number one, don't just read it as it is. Don't just look at each individual mineral without taking into account the interactions with every other mineral in the body, okay. Especially the macro minerals. Okay. And that brings us to number two, focus on the macro minerals, the first four minerals. These are also called the first level of minerals, calcium, magnesium, sodium, potassium. Focus on those. Look at the interactions between those. Try to bring those back into balance and focus your attention on the significant ratios, which is number three. So the balance between those main minerals. So the first level minerals especially, so you're going to be looking at the sodium potassium ratio, the calcium magnesium ratio, the sodium magnesium ratio and the calcium potassium ratio. So those are the four most important significant ratios. They are going to be listed in the significant ratios. Okay. So I'm going to go to questions now. Hopefully that wasn't too confusing. I'm really disappointed I could not bring up that mineral wheel. So Ellen says, "Hey, sent to question regarding fasting perhaps to tease to get minerals. Does that process work at all, or a bad idea also bad bugs and dark lines with the salted water protocol, never had that in my life. Thoughts?" So Ellen, I think these questions are related to maybe a protocol you're going through in high and energy, in which case you should direct those into the membership program so that I can better take a look at what you're actually asking me because I think it was in regards to something I told you within the membership program. So definitely make sure to ask those same questions within the membership program and then I can help you better because I can spend a little bit more time focusing on your question. Okay. Awesome guys, thank you so much for joining me today. Remember if you want to go through my clinical training for hair mineral analysis, I'll be running that the 21st of February as a live six part training with live Q and A sessions in between. Is going to be super comprehensive. I'm going to make you feel like an expert in HMA. So if this at all interests you as a practitioner or maybe just someone who is super nerdy and wants to dive deep into this stuff and doesn't know, you are intimidated hanging out with a group of nerdy practitioners, then definitely send my page a message. Let me know you're interested. I'm going to be confirming all the details by the end of this week, and I'll have the info page up shortly, which will be go.Kendraperry.net/HMA. If you get an error message, it just means I'm not done yet, but my plan is to have it done by Friday. All right guys, thank you so much. Thanks for hanging out with me today and I'll see you guys next Tuesday for the next High On Energy episode. Bye.